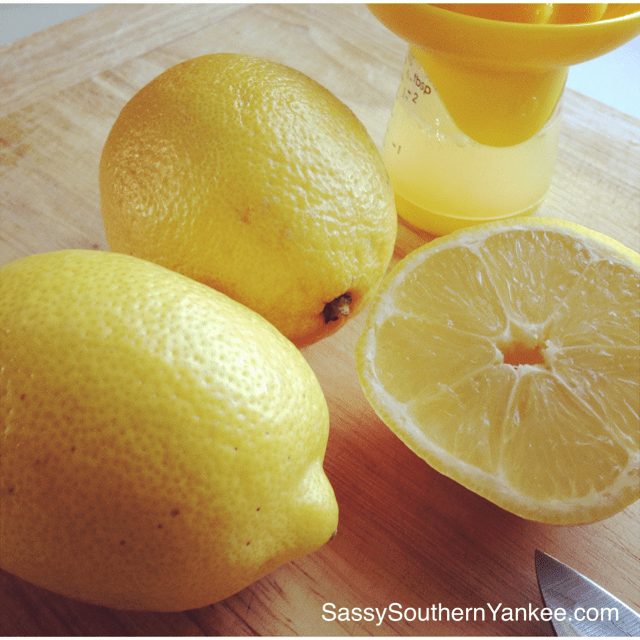 Fill a medium pot with water and add a generous amount of salt to season; heat until it comes to a rolling boil. Start the BBQ. 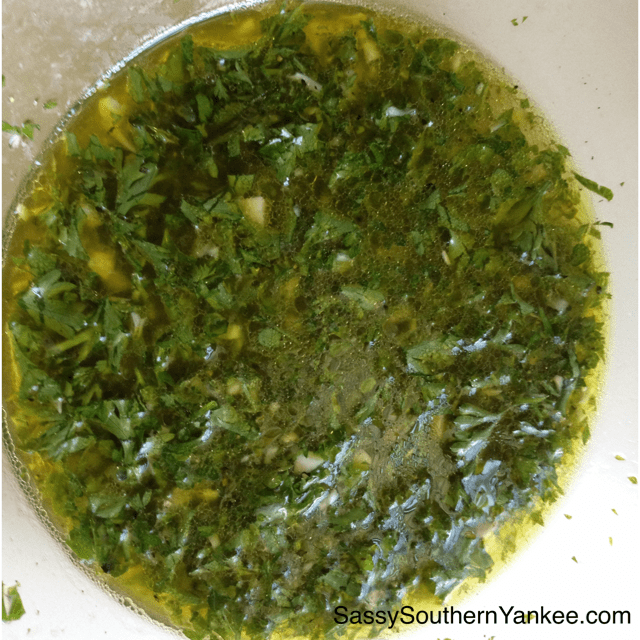 While the water and the BBQ is heating; in a medium bowl combine the juice of two lemons, olive oil, white wine, 3 cloves of garlic, 1/2 Cup fresh parsley. Add the shrimp. 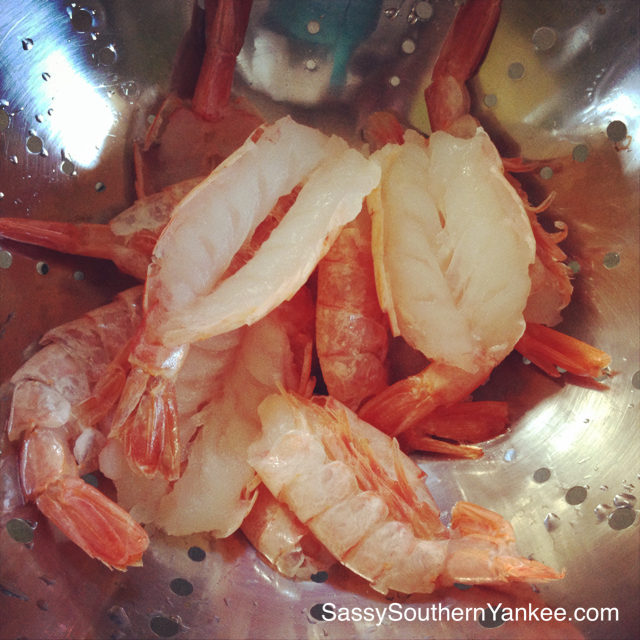 Toss and allow the shrimp to marinate for at least 30 mins. Once the water comes to a boil; add the pasta, and stir to ensure that it doesn’t stick (gluten-free pasta tends to stick majorly). Once you have the pasta started its time to put the shrimp on the grill. 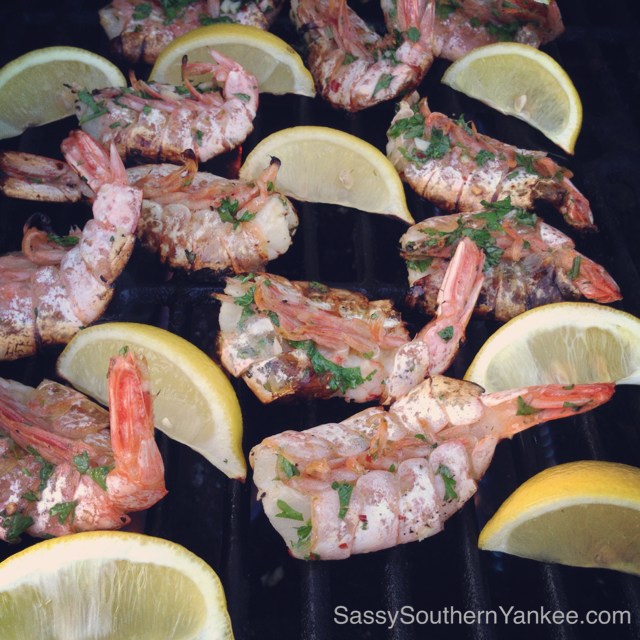 I butterflied the shrimp, so they would easily and evenly grill. You can purchase them ready to go at most grocery stores or fresh from your local sea monger. 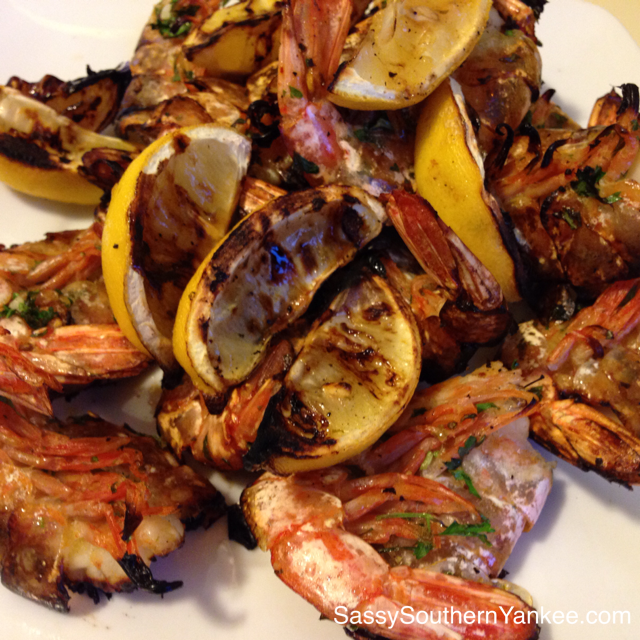 Grill the shrimp for about 8-10 min until they are no longer translucent. Remove from the grill and set aside. Now we need to finish up the pasta. Drain the pasta in a colander over the sink. While that drains using the pot we cooked the pasta in we will make our sauce (no sense in dirtying another pan). Place the butter and 3 remaining minced garlic cloves. Cook for a minuet or until fragrant. Add the remaining wedged lemon, lemon thyme and drained pasta. 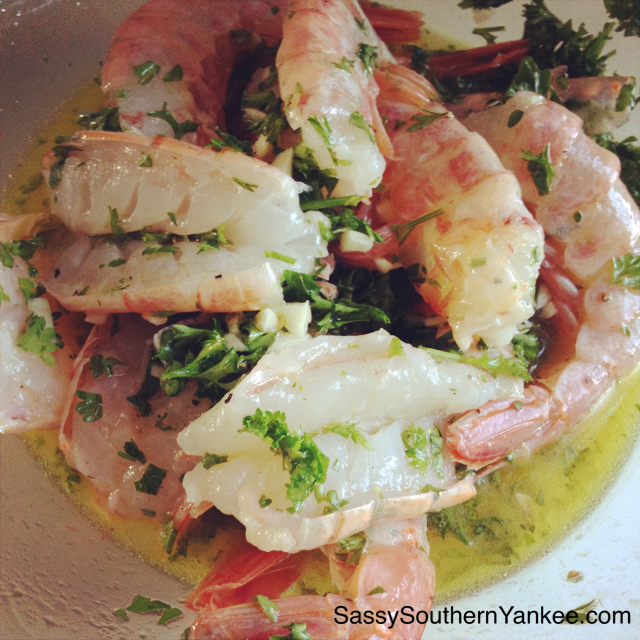 While the water and the BBQ is heating; in a medium bowl combine the juice of two lemons, olive oil, white wine, 3 cloves of garlic, ½ Cup fresh parsley and shrimp. Allow the shrimp to marinate for at least 30 mins. Once the water comes to a boil; add the pasta, and stir to ensure that it doesn't stick (gluten-free pasta tends to stick majorly). Once you have the pasta started its time to put the shrimp on the grill. Now we need to finish up the pasta. Drain the pasta in a colander over the sink. While that drains using the pot we cooked the pasta in we will make our sauce (no sense in dirtying another pan). Place the butter and 3 remaining minced garlic cloves. Cook for a minuet or until fragrant. 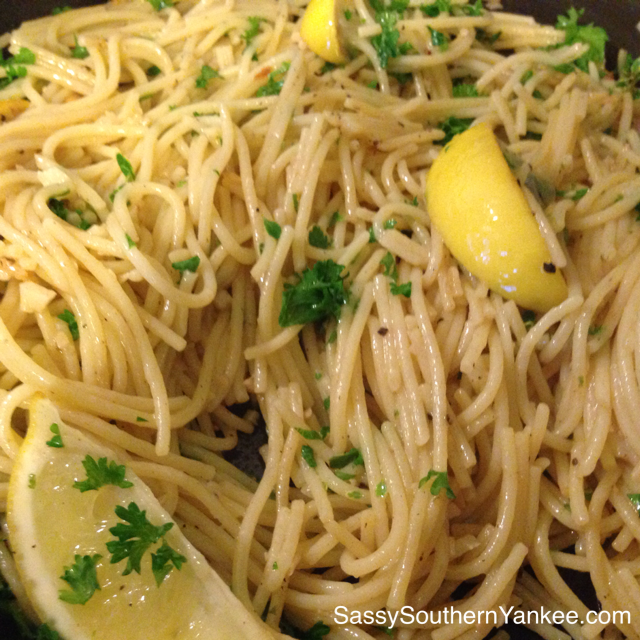 Add the remaining wedged lemon, lemon thyme and drained pasta. Toss the pasta until coated then add the shrimp. 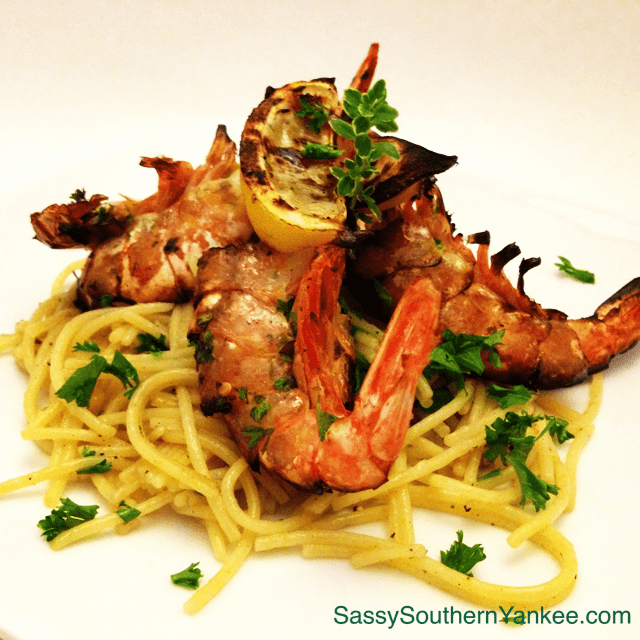 This entry was posted in Main Course and tagged Garlic, Gluten Free, Grilled Shrimp, Grilled Shrimp Scampi, Healthy Dinners, Lemon, Lemon Pasta, Lemon Thyme, Light Dinners, Parsley, Pasta, Quick and Easy Summer Dinners, Scampi, Shrimp, Thyme, White Wine.